Long cardigans (or dusters) have been trending for a few seasons now and by the looks of what I'm seeing in the stores and in Blog Land they are not going anywhere soon. My favorite time of the year to wear long cardigans is in the fall when I don't need to wear a winter coat. In the fall I don't have to worry about the cardigan hanging past the length of the winter coat, because I can go coat-less. You gals who live in warmer climates don't have to worry about that and can wear long cardigans all winter long! For today's look, I paired my long cardigan with skinny jeans, a black sleeveless shirt, black shoes and bag, and a leopard print scarf. Everything I'm wearing is old except the black hand bag. 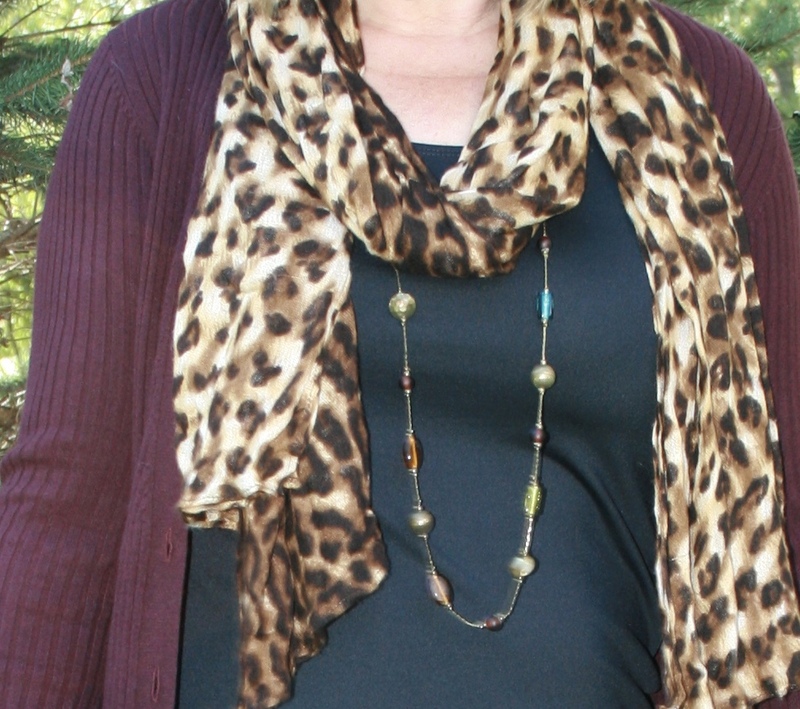 For jewelry, I chose a multi-colored long beaded necklace and a gold/black bracelet. I always wear a necklace under my scarves in case I get warm and need to remove the scarf. I don't like to be accessory-less around the neckline. This photo shows the necklace for you. And this photo shows the bracelet. I purchased the Liz Claiborne Elizabeth Tote Bag from JCPenney. 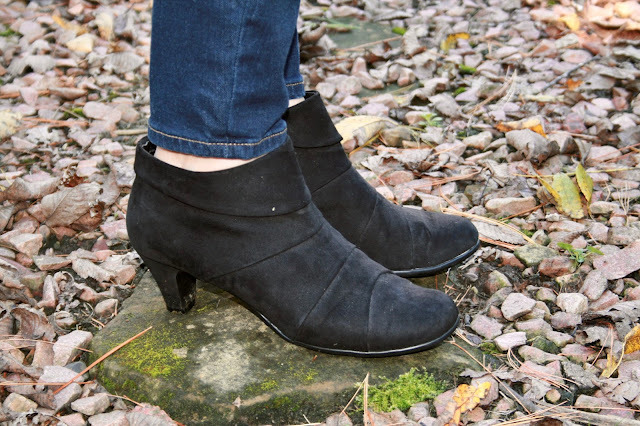 I wore black suede booties to coordinate with all the other black in my outfit. Would you believe I specifically designed this outfit for a flu shot I was getting this day? Yup! I even plan my outfits for flu shots. 🙂😁 I did go shopping for the day too, so it's not like I got all dressed up just for a shot. But, I did want the ease of exposing my shoulder for the shot, so I wanted to wear a sleeveless shirt. The cardigan was super easy to slip off to receive the shot. What about you? Did you buy any new long cardigans this season? How do you tend to style/wear them? I'd love to hear from you! P.S. If you missed yesterday's exciting news, I have a new Facebook Page! Check it out HERE! I love a long cardi. This is such a pretty color and you look amazing in the duster! 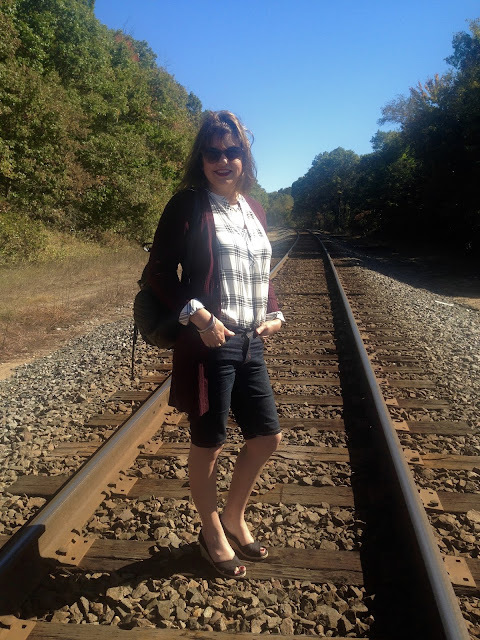 Love your beautiful cardigan! I need one in burgundy, too. 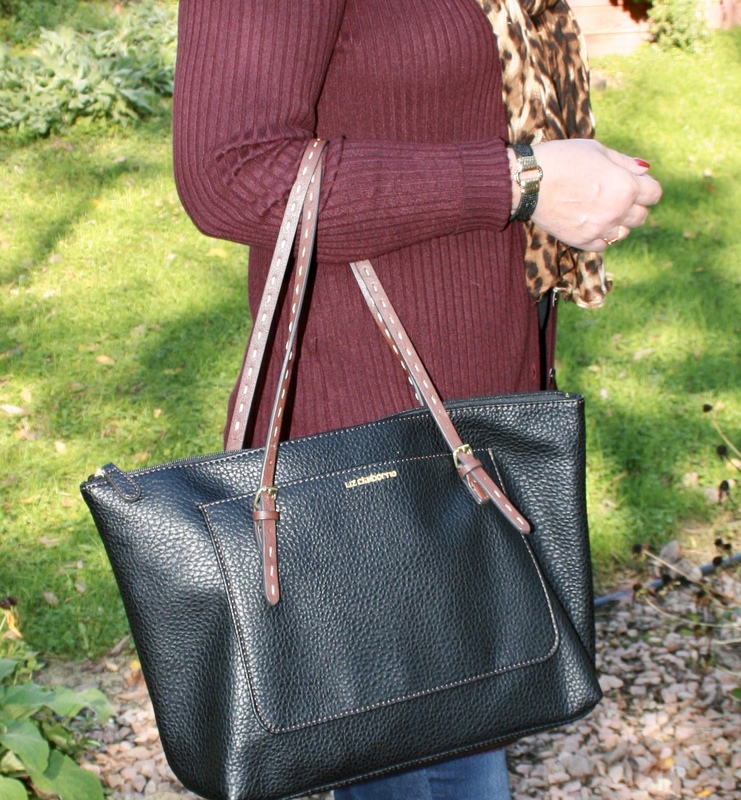 Such a great look for fall and perfect colors too! 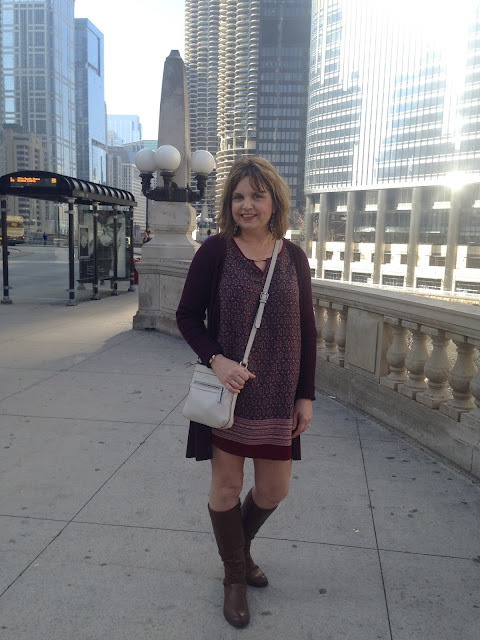 I too love wearing long cardigans in fall, I did add a new one this season, the deep orange (rust) colored one JoLynne shared on her blog in September (not sure if you saw that post of hers!) But I love that one so much that I plan on getting the same one in the "fir-ever" color as well, although the color is similar to another one that I have, but I just love this style! thanks Elli. I saw that you bought that sweater in a previous comment. I'm glad to hear you like it so well, I'm gonna have to go back and check that story out. As for flu shots, yes, I'm aware of all the talk out there about them. My husband refuses to get them. From my perspective, if I don't get a flu shot, I always, always, always get really sick. But if I do get a flu shot, I never get anything but a common cold. So I'm sticking with them for now! Ugh! I just read that the cardigan on JoLynn's blog is a wool blend. I can't wear wool. I'm allergic. The mustard color is sold out too, and that was my favorite! I love the color of that cardigan, and I love a long or short cardigan. I wear the short ones in the spring/summer and the short and long ones in the fall and winter. They are such great pieces. Thanks for linking up! The 'flu jab' outfit is casually stylish - perfect for shopping. I really like that you can wear things in different ways. I feel I look a funny shape if I change my usual 'safe' silhouettes! I almost bought a long cardigan at a basement price in the supermarket last week, but decided not to because of my fear of not being able to carry it off. You're inspiring me, though! Thank you! Oh, I'm sure you could wear a long cardigan! I think they look great on everyone! I really like your long cardigan - great color! You styled it very nicely. I love the scarf! And the long necklace adds the perfect extra interest. Oh yes, we have to dress for flu jabs - I hate ending up on my doctor's chair wearing just a bra! I love how you've styled it and I am absolutely bowled over with your idea of showing different ways you've styled a piece previously. Permission to steal at some point?! Yes, long cardis are a challenge so can only be used for short autumn and spring windows in our climate too. You've inspired me to get mine out. Hugs, x. Good to know I'm not the only one! If you don't wear the right outfit for a flu shot, it can be quite awkward. Yes, feel free to 'steal' anything. I'm glad you liked the pictures of the previous stylings. I use to just provide links to my previous stylings, but I think this works best for everyone. Less work for you to have to clink on another link! Thanks so much! Thanks for linking up to Top of the World Style. Great styling. Long cardigans are tricky. You look stunning! I love that long cardigans are back! I remember loving and wearing them when they weren't in (and harder to find), so I am thrilled to have so many choices in stores!